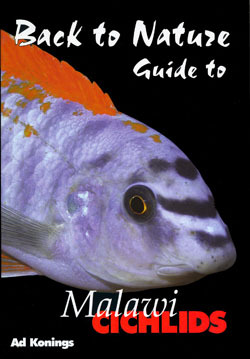 Title: Back to Nature guide to Malawi Cichlids, 2nd edition. Chapters: The natural environment, The aquarium, Water and filtration, Food and feeding, Breeding, Diseases, Some examples, Aulonocara-group, Haplochromis group, Mbuna group, Large predators group, Index. Species descriptions: More than 240 species. Each species is described with scientific name, trade name, distribution, habitat, food, breeding behavior, difficulty, maximum size (both male and female), minimum aquarium (both length and capacity), size of the brood. Published in: English, German, Swedish, Danish, Norwegian, Dutch, Polish and French. Danish - Simontorp Säteri AB, Sweden. Malawi cichlids have been, and will probably always remain, among the most popular aquarium fishes of all time. Their brilliant colors, ease of maintenance, and interesting behavior are the three most important reasons for their popularity. A selection of these fishes is all you need to create an interesting and decorative aquarium in your home. In order to enjoy your Malawi cichlid aquarium to the full, however, it is essential to take their specific maintenance requirements into account. This new guide provides expert advice on all the elements of proper maintenance, such as choice of aquarium (with details of the minimum size and capacity required for each species discussed), creating the correct water conditions, providing appropriate decor, feeding, breeding, common diseases, etc. A detailed foldout map and 600 photos make this guide indispensable for anyone interested in these beautiful fishes. Ad Konings (El Paso, Texas) is biologist of profession and has more than 30 years of experience with Malawi cichlids and has dived for more than 1000 hours in the lake. 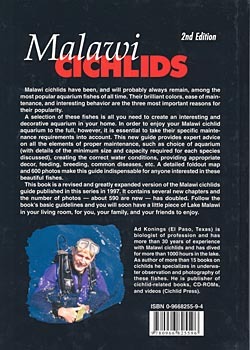 As author of more than 15 books on cichlids he specializes in underwater observation and photography of these fishes. He is publisher of cichlid-related books, CD-ROMs, and videos (Cichlid Press).